The first freezer cooking day started with me going over my freezer meals list (I use the free one I offer in the free mega freezer meals planning pack) and getting my priorities in order. Actually, the day started the night before, when I made 20 lbs of potatoes into mashed potatoes for the freezer. That allowed me to check something off my list at the beginning which is a very good feeling. Because I am all about checking things off the list. : ) Naomi also got our freezer pb&j sandwiches done the night before. 100 to 120 “emergency” pb&j freezer sandwiches is about 10-12 lunches for my family over a 4 to 6 week period. Will we have 10 to 12 days where we need to grab a bag of fruit, a stack of quick freezer sandwiches, and some water bottles and call it good enough? You betcha! There will be plenty of other days where we have leftovers from dinner the night before or make fresh salads, fruit plates, smoothies, or some combination of the above. Knowing I have a lunch back up in the freezer is huge in my overflowing momma world! 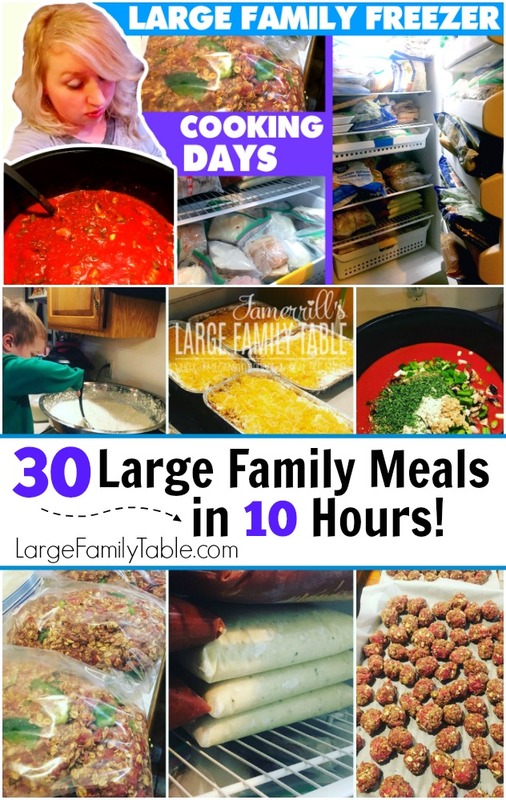 You can see an example of our one-week large family meal plan here. Zion got all situated at a French Toast station with 2 griddles and kept that going for us. The first thing I did was get 5 lbs of ground beef in each of my 2 electric pressure cookers. I have been really getting a lot of mileage out of my 8-qt Instapot but I needed a second electric pressure cooker. I went on the recommendation of a friend and picked up this wonderful 14-quart electric pressure cooker. It sure is large family size! Just making 17 dozen meatballs for the freezer on Instagram! How Long Does Freezer Cooking Take? One thing I always get asked is how long you should allow for making all this food. And that’s a tricky question, friends. You see, I don’t just make food. I prepare my large family recipes, I make out my list, I get everything ready, and then…I still don’t “just make food.” I take tons of pictures of the cooking process. I video hours of footage so that you can be encouraged to try it. I make a huge mess and I have to clean several times throughout the process. And I adapt, adapt, adapt as I go along. I also have a nursing baby. Benjamin is very happy to have Travis and the kids to play with but there are times that only Mama will do. I do take breaks to nurse him and even to lie down with him for a while here and there. Freezer cooking is not more important than my family even though I do it for my family. Besides, my feet need a break during these long days of marathon cooking. It took me about 10 hours to complete this 30 freezer meals plus some extra side items like cornbread. If you have just a few hours of dedicated cooking time without the need to stop for major interruptions you may be able to cook similarly in less time. If you have multiple kiddos of various ages at home, even with the help of a husband, friend, or relative to help with the kids while you cook, you might still come in around the 10 hour or so mark. Both of my freezer cooking days came in with a total of 20 hours for 57 freezer meals over two days. That includes start to finish with all my real life breaks, cleanups, configuring, and various interruptions. Here on Instagram, I shared my tally on my day one freezer cooking day marathon! 14 bags of Cornbread this is a nice add-on to go with a big pot of homemade chili etc. 7 loaves of Cinnamon French Toast 10 to 14 breakfasts for our family – remember this is sprinkled over 4 to 6 weeks. 17 dozen Homemade Meatballs these meatballs can be a meal in and of themselves or used as a side dish or complementary item. I like to bake up 3-4 dozen at a time in various ways (more recipes to come), so we’ll call this 4-5 meals over 6 weeks. 6- 13×9 pans of Baked Spaghetti I have several kiddos who LOVE my homemade baked spaghetti. I just bake up one pan at a time and serve with salad and butter bread. This is 6 dinners for us and sometimes a little leftovers for the following day’s lunch choices. 5 Barbecue Meatloaves that’s 5 dinners over six to eight weeks. I actually still have two in the freezer that’ll carry over to my next meal plan. 3 gallons Homemade Mashed Potatoes these are a helpful add-on item. I’m not able to whip up homemade mashed potatoes as a side dish for just one meal during this season. But if I take out a one-gallon bag from the freezer and set it in my fridge for about 24 hours, it’ll make a great side dish the following day. My favorite way to reheat these is on low in the slow cooker. And that ended day one of my first 10-hour large family freezer cooking days. We had a total of 30 meals including breakfast and dinner meals, plus the side dish and add-on items like cornbread and mashed potatoes. It was after 11:00 pm when I finally closed the kitchen for the night but I felt really good about what I got done and optimistic about freezer cooking day two! Click here to see all of freezer cooking day two where I complete another 27 big family meals in 10 hours PLUS a few extra treats and side dishes, have a kitchen sink mishap, and more! 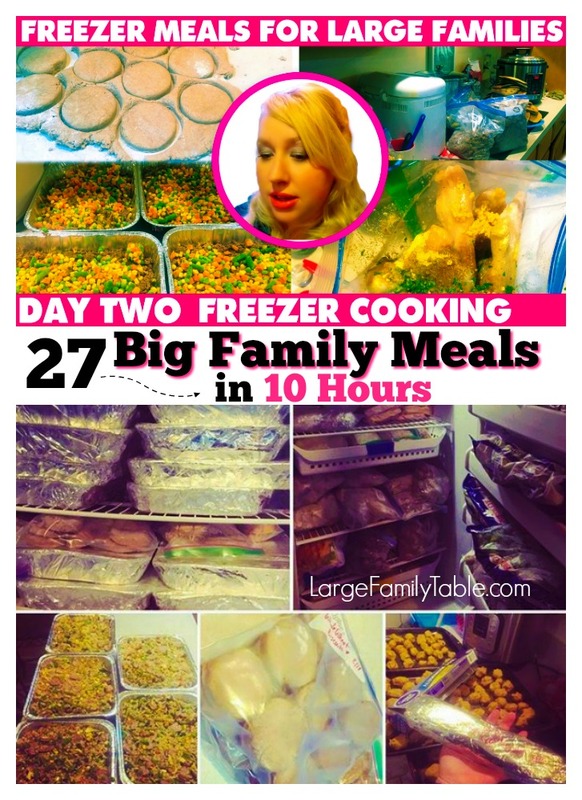 I also share the full large family freezer cooking report here that includes both day one and day two! 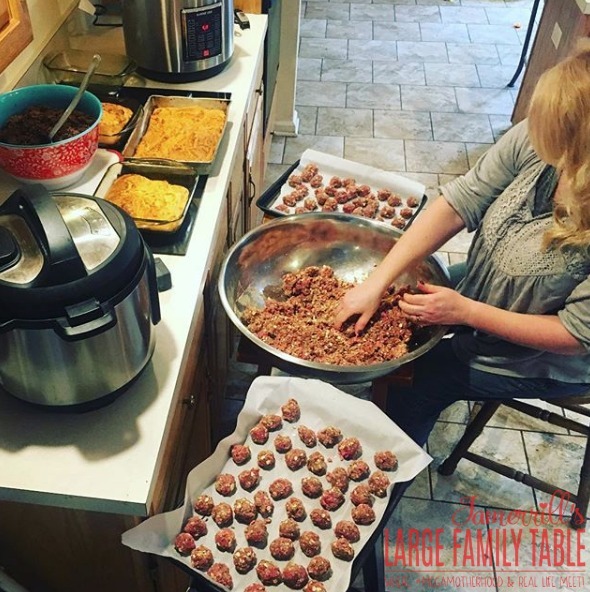 LARGE FAMILY FREEZER COOKING Day One | Freezer Meatballs, Mashed Potatoes, Baked Spaghetti, +More! 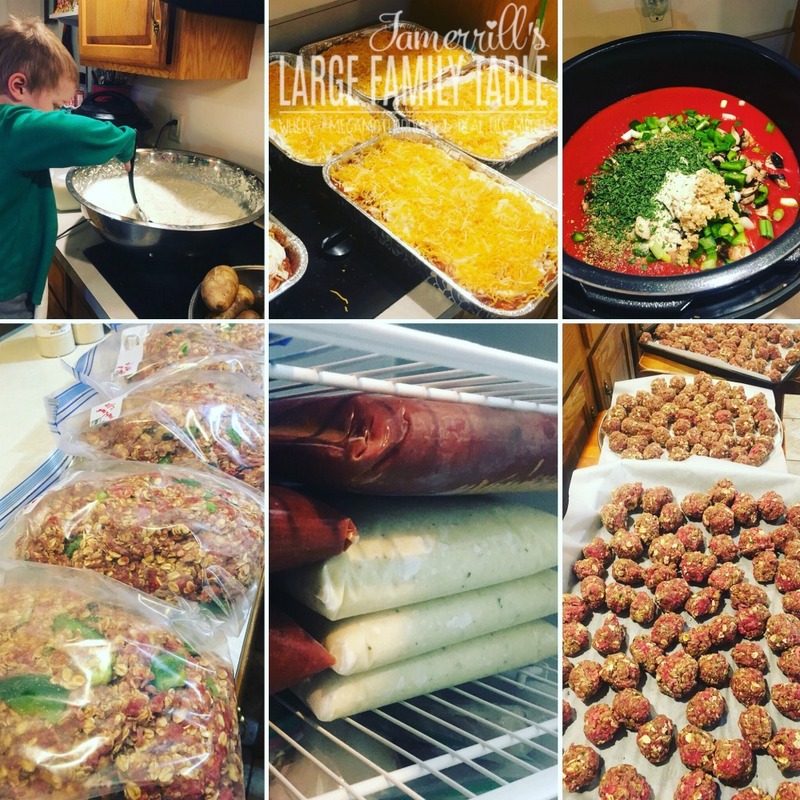 Click here to watch the full LARGE FAMILY FREEZER COOKING Day One | Freezer Meatballs, Mashed Potatoes, Baked Spaghetti, + More! 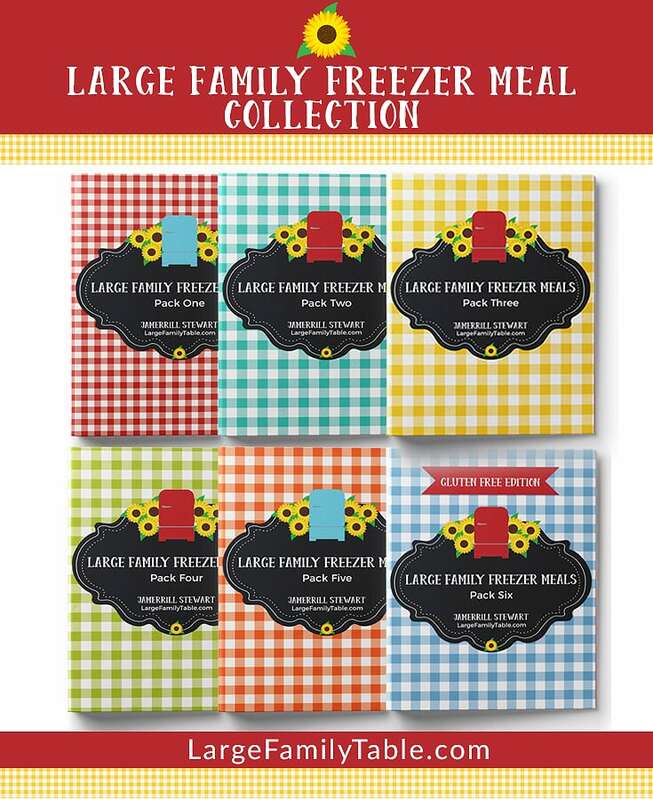 Plan Your Own Large Family Freezer Cooking Days! 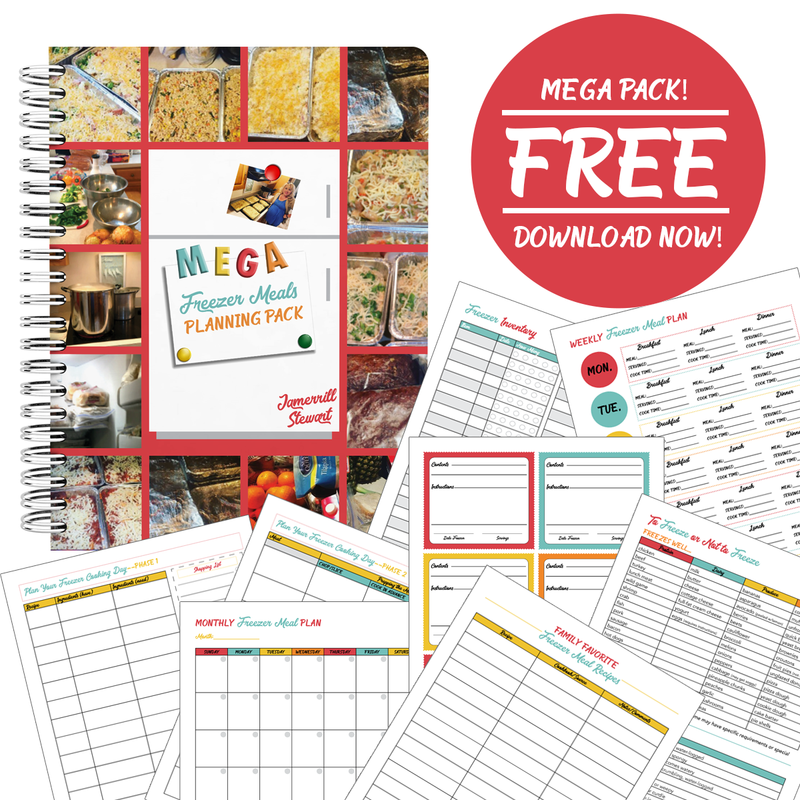 Click here for the oh’ so helpful free MEGA Freezer Meals Planning Pack from me to you!